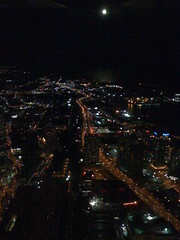 Here are some pictures from my late night trip to the CN Tower using my iPhone. I totally missed having my real camera because there was an awesome shot of the moon rising next to the tower that the phone refused to capture while I was driving. Next time! 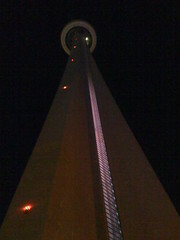 The CN Tower at night. The stripe of light going up the side. High tech security arch which puffs air to sniff you out. 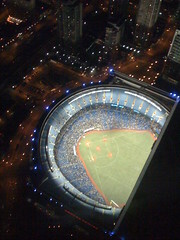 View of the Blue Jays game below. 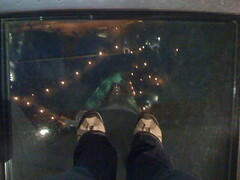 Standing on the glass floor. 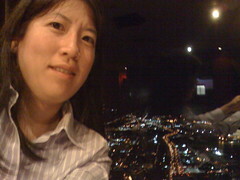 That's the tower support directly below (behind) me. 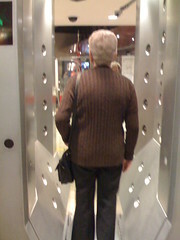 I thought I would have trouble walking out onto the glass floor, but apart from some sweaty hands and feet, it was fine. The fact that it was nighttime helped because there were a lot of reflections off the glass, so it didn't seem like I was stepping out into thin air. There were definitely people who were crawling on the floor next to the window, unable to step out. 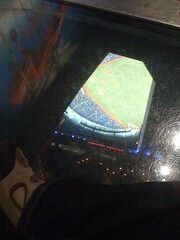 Sitting on the glass floor over the Blue Jays game. 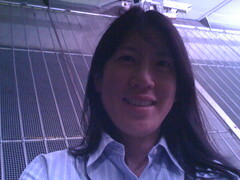 On the observation deck. It was pretty windy, but the tower didn't sway at all. Sitting at my table at Horizon's cafe. The 360 Restaurant was all booked, but there were plenty of tables here. I believe they use the same kitchen, so the food was just as good! 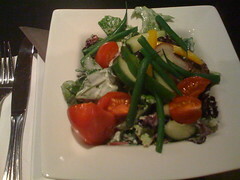 I got a salad for dinner because I was still stuffed from an Indian buffet at lunch. And dessert of course, creme brulee. There were crystallized ginger pieces with the blueberries and crystallized orange peels in the whipped cream. 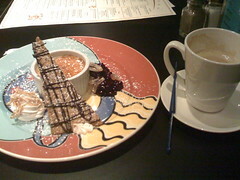 These accompaniments were much better than the creme brulee itself. 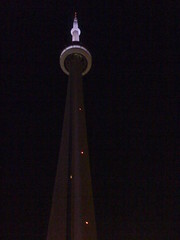 Chai tea had a stir stick the shape of the CN tower. Didn't keep it because the kids would just use it to poke each other's eyes out. 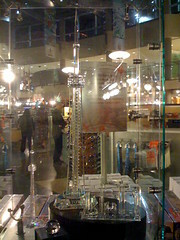 Glass sculptures of the CN Tower in the gift shop. I considered buying a snow globe, but they were all too much. Cheapskate! I did have to pay $23 just to take the ride up. 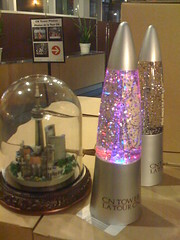 This sparkle lava lamp was pretty cool but a lot smaller than they look here, about 8" tall.